Stimulating the visual cortex of the brain for 20 minutes with a mild electrical current can improve vision for about two hours, and those with worse vision see the most improvement, according to a Vanderbilt University study published this week in Current Biology. "It's actually a very simple idea," said co-author Geoff Woodman, associate professor of psychology. "This kind of stimulation can improve cognitive processing in other brain areas, so if we stimulate the visual system, could we improve processing? Could we make someone's vision better—not at the level of the eye, like Lasik or glasses, but directly at the level of the brain?" Twenty young, healthy subjects with normal or near-normal vision were asked to evaluate the relative position of two identical vertical lines and judged whether they were perfectly aligned or offset. The test is more sensitive than a standard eye chart, and gave the researchers are very precise measurement of each subjects' visual acuity. The researchers then passed a very mild electric current through the area at the back of the brain that processes visual information. After 20 minutes, the subjects were asked to perform the test again, and about 75 percent showed measurable improvement following the brain stimulation. The researchers performed several variations of this experiment to test the effects of different intensity levels, current directions and electrode placements. This third experiment was important because it confirmed that the electrodes had to be positioned specifically over the brain's visual processing center in order to affect the subjects' eyesight—that the effect wasn't simply a response to stimulus anywhere in the brain. They also measured how the stimulus changed the speed with which the brain processed visual information and whether the stimulation also improved the subjects' contrast sensitivity—their ability to differentiate between multiple shades of gray. The contrast experiment was notable because they found that the stimulation only improved contrast sensitivity at frequencies also associated with visual acuity, indicating that it was just the subjects' visual acuity that was being affected, not the contrast sensitivity. Lead author Robert Reinhart, an incoming assistant professor in the Department of Psychological and Brain Sciences at Boston University who conducted this research as a Ph.D. student at Vanderbilt, said this finding had interesting implications for future basic science. "Now we have a new tool that could be valuable for researchers investigating fundamental questions about how the visual system works." 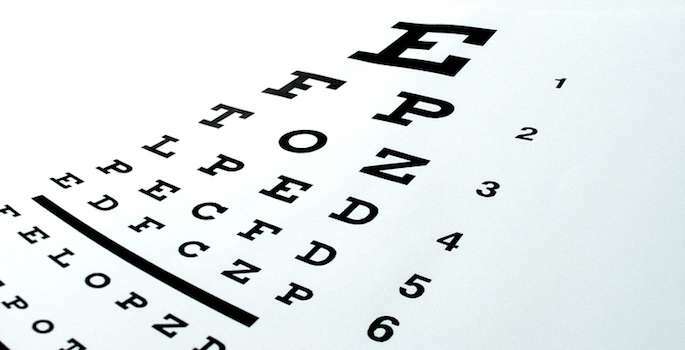 For their last experiment, the researchers wanted to see if the improvement they saw in the first experiment was significant enough to translate into a real-world task—reading a standard eye chart. They found that the stimulation effects improved the subjects' vision by an average of 1 to 2 letters, though Reinhart noted that there was significant variation between subjects. "We saw that those who came in with poorer vision, who might be on their way to needing glasses, had these big leaps, while others who came in with excellent vision showed no change." Reinhart speculated that these findings could be explained in several different ways. The prevailing belief is that the current might simply be boosting the visual signals so certain neurons can process them more rapidly, but Reinhart thinks it's also possible that the current essentially injects white noise into the visual system, which drowns out extraneous information and enables the brain to capture visual information more easily. The researchers stress that much more research needs to happen in a clinical setting in order to confirm the safety of the procedure and that members of the public should never attempt to replicate the experiment at home.